Bequeath is a word which you hopefully will not deal with too often, since it is used primarily in conjunction with someone's passing away (although some people might feel that some "bequeathing" can cheer that situation up considerably!). The word's meaning was not always so somber, however. Originally, bequeath simply referred to the act of speaking. However, the word often carried with it an implication of speaking with specific intentionality, and thus, bequeath could mean "declare away." In time, the word came to be used primarily to speak about giving something to another person through a declaration of will. In modern usage, bequeath is used almost exclusively to describe the action of formally declaring, in a will, that someone will receive something upon one's death. Perhaps you remember a scene from a British murder mystery where the family attorney reads the will of the murder victim? Often in those scenes, it is revealed that old Lord Witherington has shockingly bequeathed his entire estate to his illegitimate son or his exceptionally attractive housemaid. This means that Witherington has given everything he owns to the recipient through a formal, legal declaration of will. You yourself will probably someday make a will, and then you can have some fun bequeathing that ugly painting to your least favorite cousin. The other current usage of bequeath is somewhat similar although applied on a much larger scale. When some people make a change which has a distinct effect on persons living in the future, they can be said to have bequeathed that effect to the future persons. For example, the Greek city-state of Athens bequeathed a legacy of philosophical thought to Western Civilization. Much as individuals can bequeath their belongings to others after they pass away, whole people groups can bequeath legacies to those who follow them in history. However, the latter usage of bequeath does not include any intentional declaration. The Athenians did not leave the philosophy of Plato and Aristotle to "Western Civilization" in a will. Bequeath simply describes the process of transmission and assimilation which has occurred over time. Example: Aunt Mabel, may she rest in peace, has bequeathed all of her seventeen cats to me, although I would have liked to inherit her Scrabble set instead. Example: The prodigality of this generation will bequeath a great deal of debt to the next generation. Bequeath was derived from the Middle English word bequethen which was in turn derived from the Old English word becwedan, meaning "to speak to, to exhort" or "to leave by will." The Old English cwedan is an appropriation of the Proto-Germanic kwethan which bears the same meaning. It was not until the 13th century, however, that the word gained its more focused, modern meaning. Bequeaths: The present third person singular tense indicates an ongoing action of bequeathing. Example: "It is not important to me who she bequeaths her fortune too!" lied Andrea testily. Bequeathed: The past tense of bequeath can also be used as an adjective describing something which has been passed on posthumously from one person or generation to another. Example: I can't believe that Uncle Jimmy bequeathed his candle collection to Joaquin. Example: Louie was quick to squander all of his bequeathed money. Bequeathing: The present participle or gerund form of bequeath communicates an immediately occurring or continuously occurring action of any of bequeath's verb meanings. Example: Bequeathing much of his probably ill-gained money to various charities eased the old man's conscience. Bequest: Bequest is a noun which can refer to either the act of bequeathing or a thing or sum of things bequeathed. Example: Although he acts as if he has great business acumen, most of his fortune was actually acquired by bequest. Example: The generous bequest left to the museum will be enough to fund the new exhibit. Bequeathal: Bequeathal is a noun which refers to the act of bequeathing. Example: Harold was the only member of the family so gauche as to openly express his excitement about the bequeathal of grandmother's property. Devise is very similar to bequeath. In fact, today they are often used as functionally equivalent, especially in legal wills. 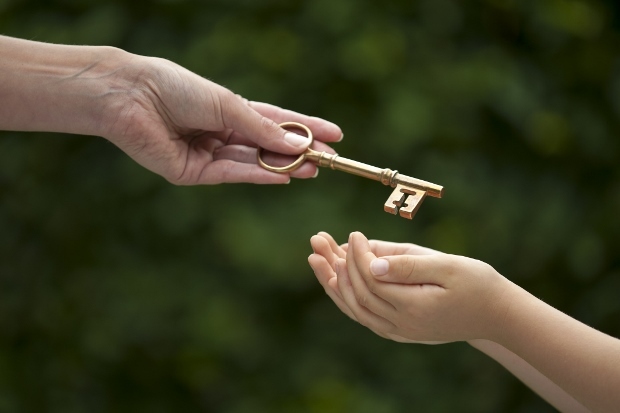 However, in the past and technically still in the present, bequeath referred to the giving of personal property in a will, and devise referred to the giving of real property in a will. Personal property is typically portable goods or cash, while real property is immovable goods such as real estate. Here, Whitman uses bequeath somewhat unusually to express his desire, not to leave material goods to others, but instead to merely leave his body to the earth.. When you're buried six feet underneath. Bring out the linguist in you! What is your own interpretation of bequeath. Did you use bequeath in a game? Provide an example sentence or a literary quote.